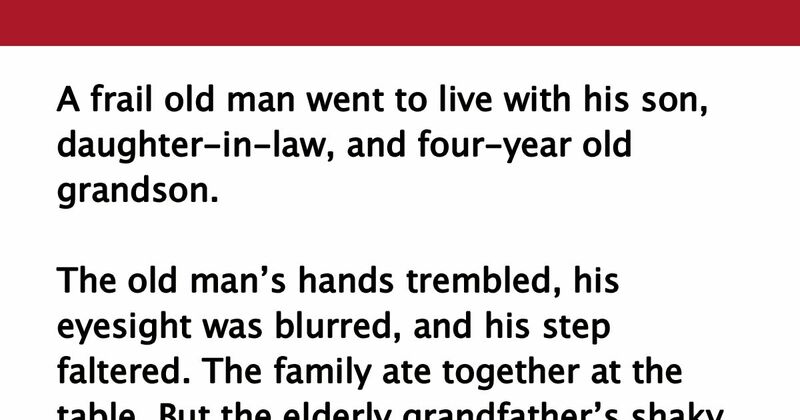 A frail old man went to live with his son, daughter-in-law, and 4-year-old grandson. The 4-year-old watched it all in silence. One evening before supper, the father noticed his son playing with wood scraps on the floor. He asked the child sweetly, “What are you making?” Just as sweetly, the boy responded, “Oh, I am making a little bowl for you and Mama to eat your food in when I grow up.” The 4-year-old smiled and went back to work. Have you told your parents how much you love them lately? SHARE this story with your friends on Facebook and spread the love!